Black acid free is created especially for framing. 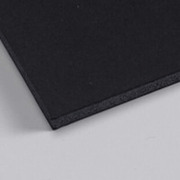 Black on black Acid Free Foamboard delivers two sided acid free protection, protecting mounted artwork from damaging pollutants and harmful gases. Lightweight, rigid, easy to cut and smooth mounting surfaces. Choose from 1/8" or 3/16" thick. 25 Sheets per carton. 275 points will be rewarded when you are logged in to your account and buy this item.